Meeting is a continuation of Netanyahu's August 2018 visit to Lithuania. 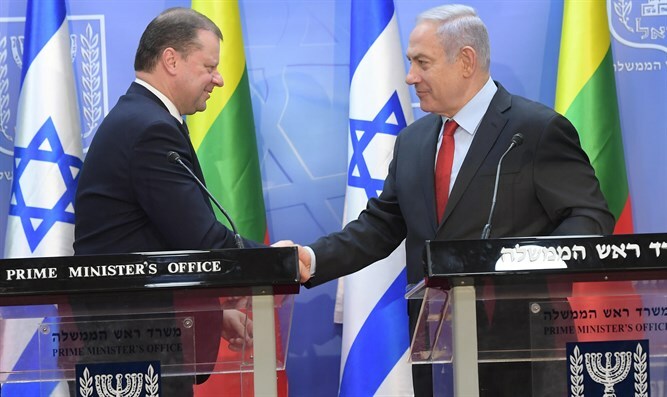 Prime Minister Binyamin Netanyahu on Tuesday evening met with Lithuanian Prime Minister Saulius Skvernelis at the Prime Minister's Office in Jerusalem. The meeting was in continuation of Prime Minister Netanyahu's August 2018 visit to Lithuania and was also attended by Economy and Industry Minister Eli Cohen and Lithuanian Economy and Innovation Minister Virginijus Sinkevicius. “This morning we were both at the Cybertech Tel Aviv, which is Israel's leading cyber-security conference. And yesterday, our two countries signed a declaration of intent to increase our cooperation in cyber-security. This is just one example of the growing cooperation between us. It's significant and it's heartwarming,” continued Netanyahu. “I discovered in my visit that Lithuania is a world power in laser technology. It was, I think 10% of the lasers in the world are produced in Lithuania. This immediately made an impression on me because I know that everything that we do in automotive technology, many of the things are related to lasers and there's an immediate fit that I believe could take place. But I think this applies in many other areas. We have, I think, a brilliant future in cooperating together,” Netanyahu said. “But equally I think we also know the tragedies of the past. Seventy years ago, Israel came into being. Before that, the Jewish people were utterly defenseless, as happened also in Lithuania. Ninety-five percent of the Jewish community there, an incredible Jewish community, was murdered by the Nazis and their collaborators,” he continued. “I want to welcome you in this spirit of friendship. I want to assure you that there's great sympathy and a great desire to see our relations expand. There are many Israelis of Lithuanian descent, you are talking to one of them, but this is a bridge from the past to a future. And I welcome you here to Jerusalem and say: Next year in Jerusalem as well," concluded Netanyahu.